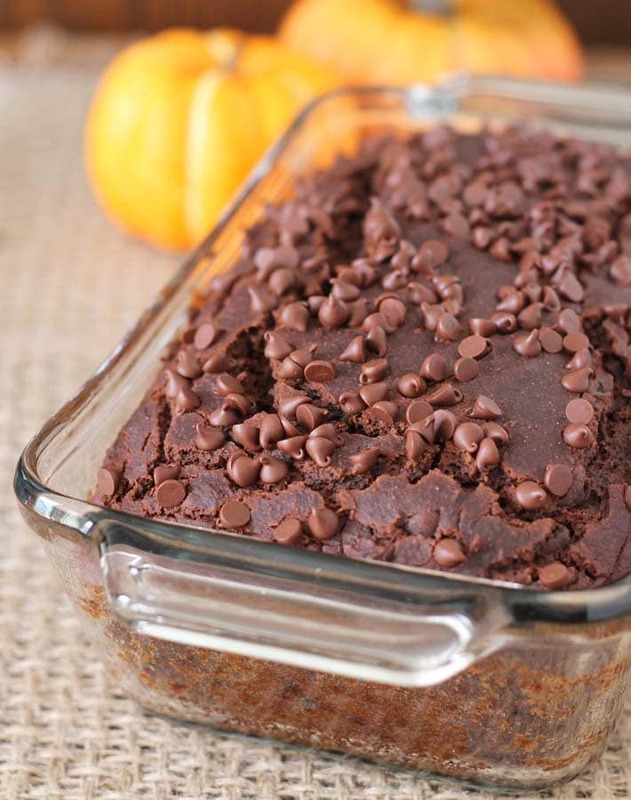 This rich, chocolaty, dense vegan gluten-free chocolate pumpkin bread that’s packed with chocolate chips and pumpkin spices will become a new favourite during the fall…and beyond! It’s a bit of an understatement to say that I love baking with pumpkin. Pumpkin adds a great texture to baked treats, and along with warm fall spices, the end result is a recipe you’ll want to make all the time (not just during fall). 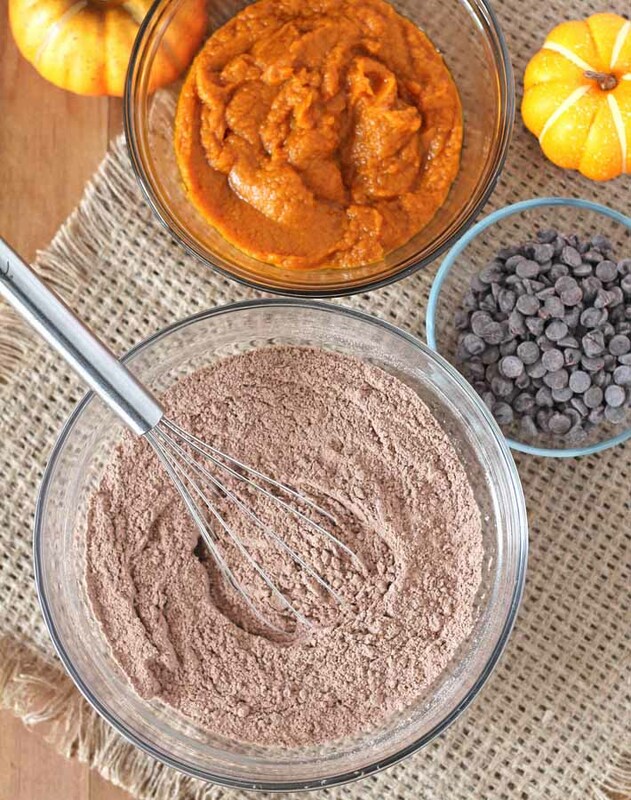 And did you know that you can make your own pumpkin puree for all of your fall recipes? I make a batch each year as soon as the grocery stores start carrying pie pumpkins. Read this step by step that will walk you through how to make and freeze your own pumpkin puree so you always have some on hand for all of your favourite pumpkin recipes. I had to use canned pumpkin for this recipe because I haven’t had the chance to make this year’s batch just yet, but no matter which kind you use, canned or homemade, your result is going to be a delicious chocolate treat that I hope you love as much as I do! 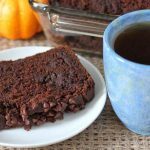 This chocolate pumpkin bread is a double chocolate recipe because of the cocoa powder AND chocolate chips in the batter. But you can easily make it a triple chocolate treat by sprinkling some mini chocolate chips on the top before baking. 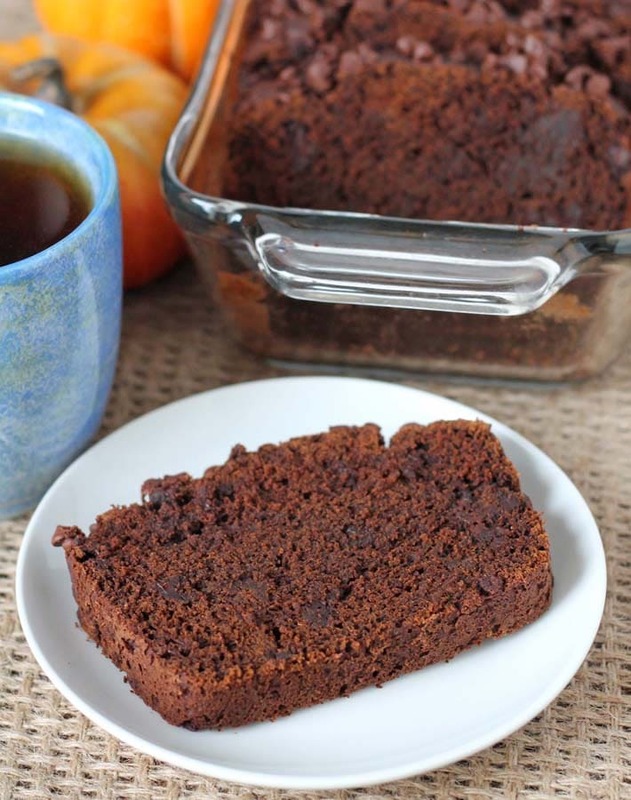 It’s not necessary, but it will make your pumpkin chocolate bread it a little more chocolaty and perfect for those who can’t get enough chocolate. Are you one of those people? I am 🙂 I always say that there’s nothing wrong with more chocolate. Ever! This recipe will make you a chocolate pumpkin bread that’s rich and very chocolaty. 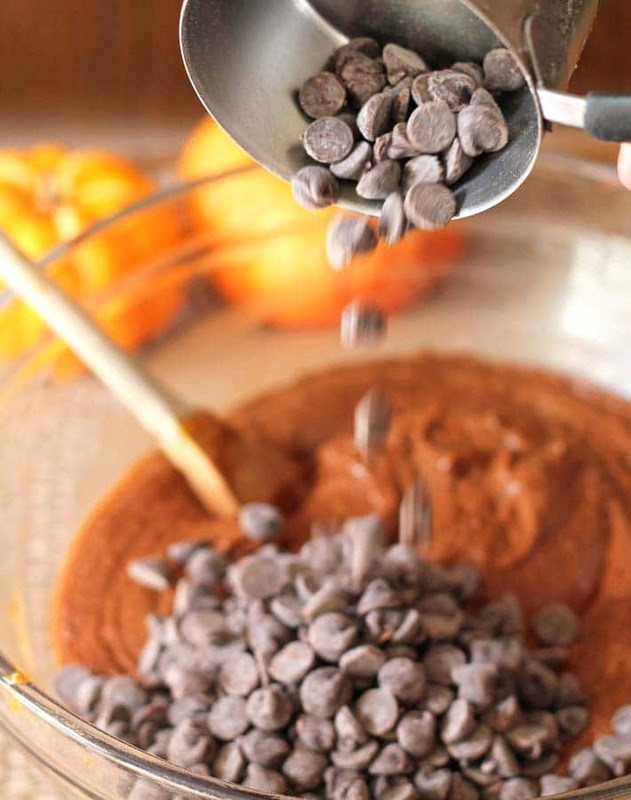 It uses unsweetened cocoa powder and semi-sweet chocolate chips, so it’s not too sweet. The pumpkin spices are subtle but definitely there in the background, but the dominant flavour is the dark chocolate. The texture is dense and firm, but be careful not to get excited to slice into it too early! You must let it fully cool before slicing, or it will crumble. It firms up as it cools. And be careful not too over bake. As mentioned in the recipe notes, there are many different gluten-free flour blends available at the grocery store. All of them use different ingredients and ratios, so results will vary if you substitute, they don’t all work the same and they all require a little experimentation to get recipes just right (even though some may say that you can use it as a 1 to 1 replacement for regular flour). I have never used any other brand of flour to make this recipe (other than Bob’s Red Mill Gluten-Free All-Purpose Baking Flour with the red label, not the blue! See the proper flour in the link), so please know that your results may not be the same as mine if you use a different gluten-free flour blend. If you’re not gluten-free, regular all-purpose flour will probably work, but you will likely need to add some more non-dairy milk to the batter than the recipe calls for. I have not tested with regular all-purpose flour to know how much, so proceed with caution because I cannot give you first hand instructions. And coconut flour will not work in this recipe. Do I need to make any changes if I use homemade pumpkin puree instead of canned? Homemade puree tends to be a little runnier than canned, unless you take some extra steps to remove the extra liquid. If your puree is on the runny side, cut back on the non-dairy milk by using only 1/4 cup. What brands make vegan chocolate chips? There are many vegan chocolate chip brands, but they may not be labelled as vegan or were not intended to be made vegan, they just happen to be. To figure out if a particular brand is vegan, be sure to read the ingredient list and look out for dairy ingredients. If you’re in Canada, President’s Choice decadent semi-sweet chocolate chips are also vegan and are very easy to find. Before you head down to the recipe, be sure to subscribe to my newsletter to stay up to date on all of my latest recipes. 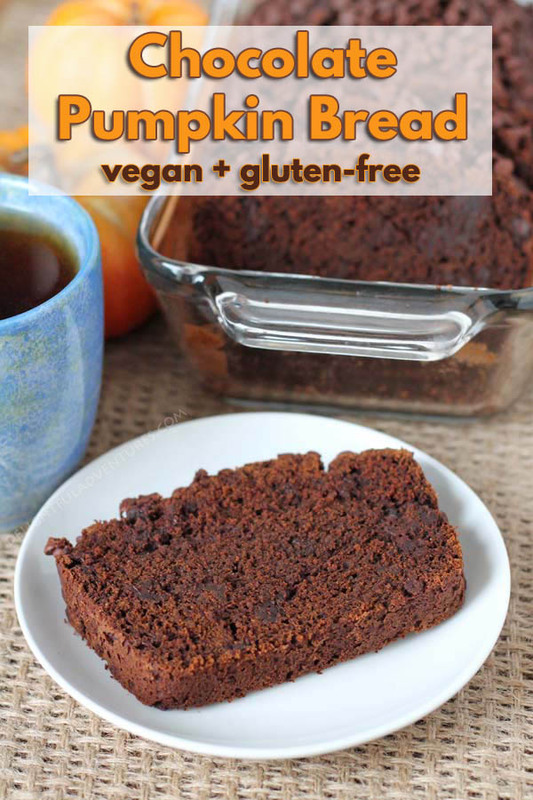 And if you make this vegan gluten-free chocolate pumpkin bread, tell me about it in the comments below! 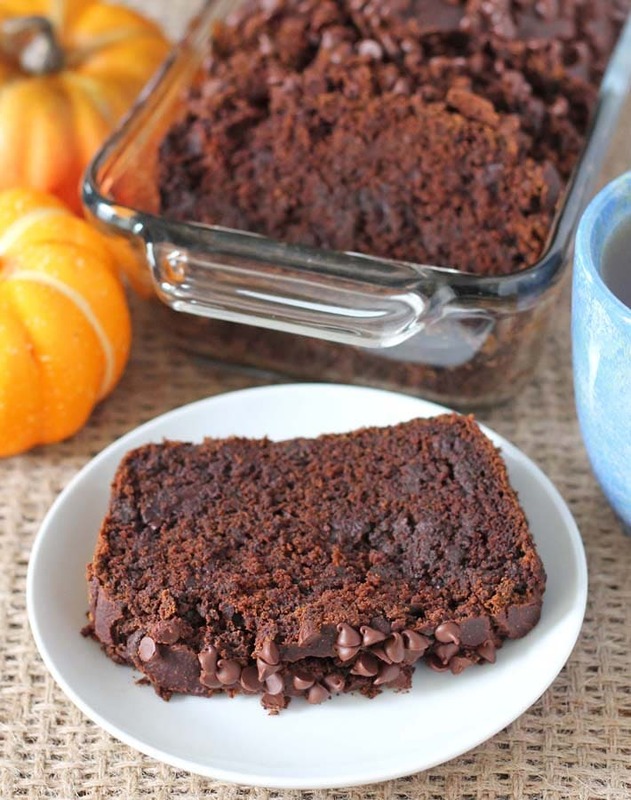 Rich, chocolaty, dense vegan gluten-free chocolate pumpkin bread that's packed with chocolate chips and pumpkin spices will become a new favourite! In a large bowl, whisk the flour, coconut sugar, cocoa powder, baking powder, baking soda, salt, cinnamon, ground nutmeg, and ground ginger together. In a small bowl, mix the melted coconut oil, pumpkin puree, non-dairy milk, vanilla, and flax mixture together. Pour into greased loaf pan. If using, sprinkle mini chocolate chips on top. Bake for 50 minutes or until a tester comes out clean. See note. Remove from oven and let it cool on a cooling rack for about 20 minutes. After the 20 minutes have passed, remove from the pan and place back on the cooling rack. Allow it to fully cool before slicing or it will crumble. 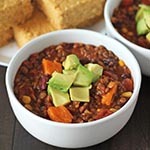 Before making this recipe, be sure to read the FAQ section above. If you don't have the separate spices (cinnamon, nutmeg, and ginger) you may substitute them with 2 teaspoons of pumpkin pie spice. This will give you a stronger pumpkin spice flavour than if you were to use the separate spices. It's important to know that different gluten-free flour blends use different ingredients and ratios, so results will vary if you substitute. 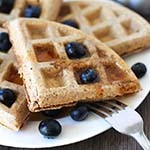 I have never used any other brand of flour to make this recipe (other than Bob's Red Mill Gluten-Free All-Purpose Baking Flour with the red label, not the blue! See the proper flour in the link), so please know that your results may not be the same as mine if ingredients are substituted. Baking times will vary slightly, depending on your oven and the type of bakeware you use. 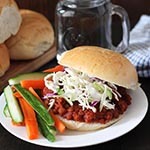 I use a glass loaf dish when making this recipe. Start checking around the 50 minute mark. Allow to fully cool before cutting into it or it will crumble. It firms up as it cools. Nutrition info listed below is for 1 of 12 slices (without optional mini chocolate chips) and is only to be used as a rough guide. Click here for more info on how nutrition info on this website is determined.